I left the Olympic Excellence Series all fired up and proud. I continue to think of the many messages that resonated with me. Ray Zahab started things off with such incredible energy! Achieving our goals, he said is “90% mental and the other 10% is in our heads.” His belief in “sweat equity”; that our most rewarding tasks are usually the hardest seemed to strike a chord with the group. Another quote of Ray’s that stuck with me was: “The sum of all our yesterdays brings us to where we are today.” As Ray dropped himself onto his little yellow snow sled in the Yukon and contemplated all the ‘good’ reasons and excuses he could give to others for not finishing; he realized the truth that “You are the only person who will know (or care) what happened.” It was enough to get him up and pushing forward. He didn’t want to (or need to) give up on himself. The Winter Athlete Panel was full of highlights. “As soon as you put meaning to what you do, there will be stress. You need to be comfortable in that stress.” Alex Bilodeau combats his stress and ‘what if’s’ with his “I Know…” list. In 2010 at the top of his last Olympic moguls run, that list led him to believe he had done everything he could to be prepared. He had no regrets. He had managed his friends and family by sending them an email about a year out from Games, directing any Olympic questions to go only to his dad. Important as they all are to him, he wanted nothing to do with their plans and planning. As Mellisa Hollingsworth shared her pride in her preparation and then her devastation from a mistake made at the worst of time. Her message was clear, “You are what you are, you can’t suddenly be more perfect.” Over-focusing and over-trying is not the way to achieve your Olympic dream. “If I’m over thinking—I’ll over do it.” Trust your preparation and your game plan. Acknowledging that her experience of racing in five events was unique, Kristina Groves pointed out that her preparation resulted in a range of results, and emotions. “Focus is not a miracle,” she said. “You create it.” When asked about how she managed the pressure of expectations, she simply said that she felt lucky that her big team had many strengths and could spread that pressure around. I would hope that after this OES you realize that you are part of a bigger team too. Just as her speed skating team could share the load of expectation so can Team Canada. No one person or team needs to carry the whole load. The Summer Panel produced just as many highlights. The Canadian Team in London will be led by some incredible veteran athletes. Thank you to Alex Despatie, Emilie Heymans, Adam van Koeverden and Lesley Thompson-Willie for sharing your insight. From AvK “Know your own normal.” From AD “Have a plan but be ready to adapt. There is no perfect plan,” and “dive for yourself”. Just as AD cautioned about “over-wanting it”, LT-W said that you’ve got to go the Olympics ready to do something Olympic. Olympic effort comes from your preparation and planning –it can’t come from just the moment itself. EH pointed out that the Olympics are different, particularly the media. “Learn to work with it –it’s going to be there.” It seems to me that after 3 Olympics, she might even enjoy it now! Octogenarian Ernie McCullough was a surprise guest and your Chef de Mission did an incredible job conducting a thoroughly entertaining interview. His account of travelling to and racing in the 1948 London Olympics had us all enthralled, and we had a great chuckle as he bragged about beating Jessie Owens once… at golf! “You won’t know how you did at the Olympics for about 30 years,” he told us. This man is living an extraordinary life that seems to have known no self-imposed limits. He wished us to be Grateful, Purposeful and Realistic with our lives. Maybe one of my favourite lines came in the athlete’s discussion on Building Confidence for Games. Adam van Koeverden reminded everyone in the room, “You’re not a beginner just because you haven’t been to the Olympics.” In the same discussion Adam acknowledged the responsibility of veterans to help build up their young teammates. A simple supportive comment “can turn a -5 day into a +5 day.” I’d like to add to that; just because you are a veteran does not mean you are expected to know everything. We are all still learning and it’s powerful to be curious. At the end of 2.5 days you were a Team. Bound together by laughter, learning and a new understanding that you all share more than just a common goal; you share a common philosophy. 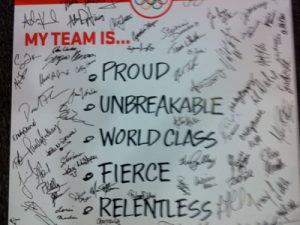 The Canadian 2012 Olympic Team is Proud, Unbreakable, World Class(y), Fierce and Relentless. It’s now December 1st… 239 more yesterdays to go! Thank you for being so present and contributing to the WOW. Thank you to Mark Tewksbury and Sylvie Bernier for all of the passion and energy that they contributed and continue to commit to this Team as you all work to earn your BEST SUMMER EVER! Enjoy December – and any holidays that you might have. This entry was posted in Mentor Messages and tagged 5 words, London 2012, OES, Olympic Excellence Series by Marnie. Bookmark the permalink.